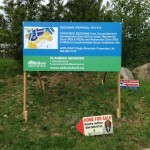 Rezoning signs are very similar to development signs and they are often seen throughout Lower Mainland Municipalities. 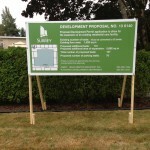 The dimensions for the majority of these signs are 4 x 8 feet and 4 x 6 for rezoning signs located in Delta. 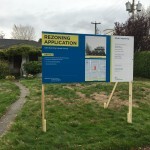 The main purpose of this signage is to inform the public of a potential rezoning of a property. Coroplast is the most commonly used material for rezoning signs in all local municipalities. In the past, plywood was the choice material for these signs, but most sign companies will now use Coroplast. 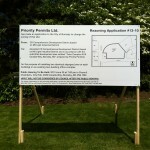 Coroplast is ideal for rezoning signs because it is light weight, cost effective, and can easily be reused or recycled. 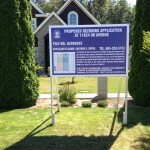 Simple Sign offers an all-inclusive sign service for all Lower Mainland Municipalities. This all-inclusive sign service includes: graphic design/proofing, sign construction, sign installation, and a free/optional sign removal. Simple Sign specializes in development and rezoning signs and we are very familiar with the sign guidelines and requirements for all Lower Mainland Municipalities. The Coroplast material we use for signs can easily be recycled or reused. To help reduce our company’s impact on the environment, Simple Sign includes a free/optional sign removal service with all rezoning sign orders. 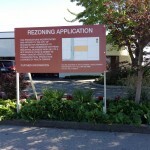 This eliminates the customer’s need to dispose of their rezoning signs once they are no longer required. This also helps Simple Sign to keep our signs out of landfills and to reduce our company’s environmental impact. 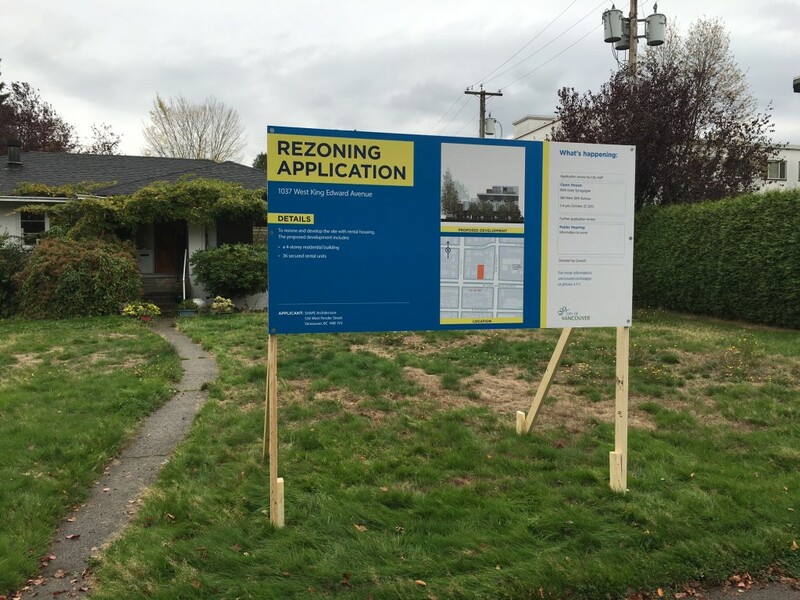 All local municipalities have specific requirements and guidelines for rezoning signs. For more information on the development/rezoning application process for Lower Mainland, click the following links: Vancouver, Burnaby, Delta, Richmond, Surrey.